, MAIN RESULTS INTEGRATION OF A RAPID TEST INTO FRENCH GUIDELINES IN ORDER TO IMPROVE TETANUS PROPHYLAXIS IN PATIENTS PRESENTING WITH WOUNDS TO EMERGENCY. 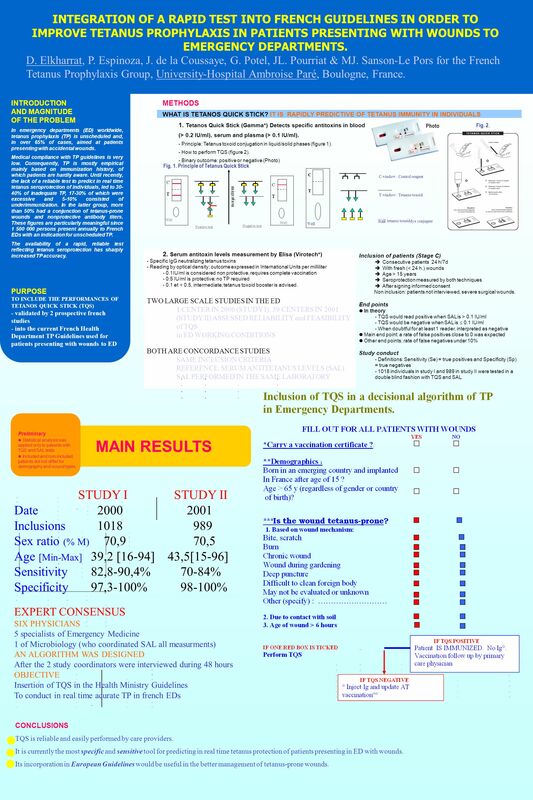 Download ppt ", MAIN RESULTS INTEGRATION OF A RAPID TEST INTO FRENCH GUIDELINES IN ORDER TO IMPROVE TETANUS PROPHYLAXIS IN PATIENTS PRESENTING WITH WOUNDS TO EMERGENCY." The Newcastle-Ottawa Scale (NOS) for Assessing the Quality of Nonrandomized Studies in Meta-Analysis G. Wells, B. Shea, D. O’Connell, J. Robertson, J. Evaluation of the CDC Guideline for Prevention of Surgical Wound Infection Presented by Sujha Subramanian, PhD, Lucy Savitz, PhD, Linda Pucci, MA, Shulamit. Module 4: HIV Testing Strategies and Algorithms. 2 Learning Objectives At the end of this module, you will be able to: Discuss the process for developing.